We're excited to introduce Brice Spencer. He completed his first novel using Novelize! We’re so excited for him about this huge accomplishment! After all, almost everyone wants to write a book but few people really get it done. The following is an interview with Brice where he talks about his book. As far back as I can remember, I continually found myself running away in my mind to places I’d never seen before, completely imagined, and in most cases, completely unreal. It was an escape to places where I felt safe and could be free to live and wonder. I would tell stories to myself as if I were a character in my own adventure. I wrote some of those adventures down but being of a young age, quickly became frustrated with my inability to put the right words with what my mind could imagine. So, I stopped. I didn’t quit, I just stopped for awhile. Life started to pull me away from those worlds I made up and eventually quieted them all. Then, in my mid-twenties, as I started facing painful memories and working through my own spiritual health, I found those places again, opened up before me as if welcoming me back to the comfort of those worlds-- my worlds. I began writing again. Slowly at first, painfully drudging through writing my own poetry and starting to experiment with the structure of the short story, I found myself in love again with what I had created. It came back strong. My first novel came from one of those first short stories. My first novel is a story I would enjoy reading as well as writing. It is a story of what God’s vengeance might look like in a dusty, broken world much like our Old West. Gunslingers touched by God to bring true Justice to a land thirsty for it. It is a novel, at its depth, about redemption and rebirth. I just made it a little cooler with Beasts and demons. It’s kind of a tip of the hat to the classic western with an inspired nod to one of my favorite authors, Stephen King. I hope it’s a good nod to the man. Finding time to write and making a schedule to do so has been (and continues to be) the most difficult piece of this craft for me. In my middle age, I married late and over the past five years have been living a wonderful life with my family-- my beautiful wife and equally beautiful step-daughter. It’s hard to find the time as they are my priority but my job is my saving grace as far as time is concerned. Luckily, I work for a school district and am able to be off work and home by 4 P.M. That gives me about two hours a day during the week where I try to sit down and put my fingers to the keys and make things up. Good or bad, it just spills out, and at some point I go back over it and see what works and what doesn’t even come close. It isn’t as consistent as I would like, but I hope that changes over time. 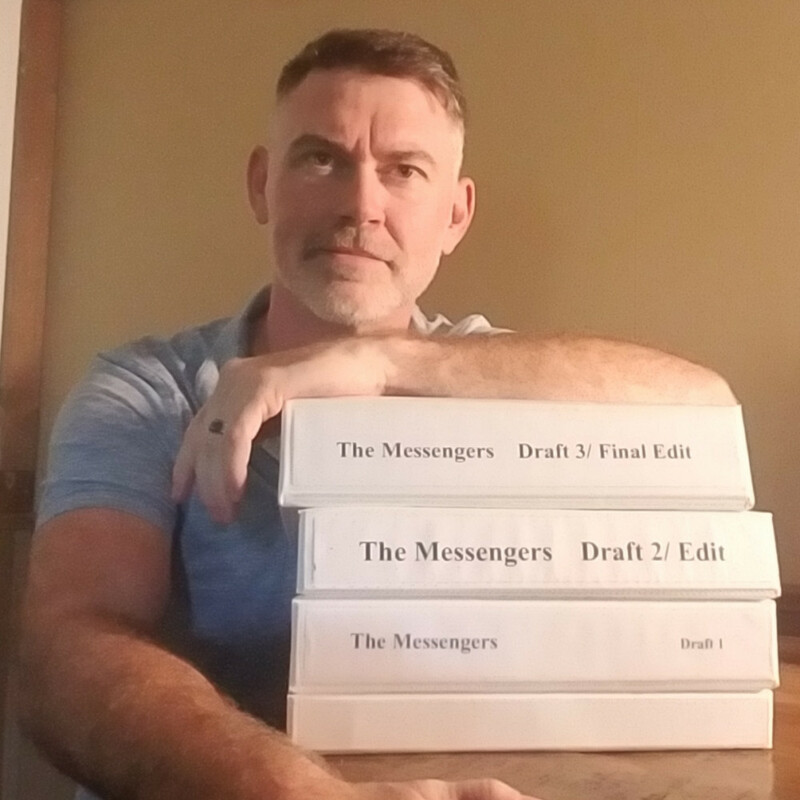 From concept to Final Draft (as “Final” as any draft can be, anyway), my first novel took an even twenty years. It was a big concept for me to wrap my inexperienced mind around. But, it was what I needed to get everything in place where it needed to be. At the moment, I’m about two-thirds done with novel number two and have a long, long list typed up neatly in my Google Docs of ideas for many stories to come. The ideas are there. As of now, my first novel is the only story I have set in that supernatural western genre (is that a genre?). I look forward to expanding my creativity and dipping my fingers into many different genres to tell the stories I plan to tell. The world is a wide open place and some stories cry out to go out far beyond its reach. My first novel is set in a grand Old West landscape that was an absolute blast to write about. I have ideas to keep that story going, whether in a trilogy or some kind of ongoing series, I don’t know. I sought out to do my research so that’s what I did. I looked at many software options that looked good enough to be great tools for me but Novelize was my best option. I didn’t need so many bells and whistles that my words would get lost in their confusion. I needed a software that benefited me and helped me get my words on a page, one by one, sentence by sentence and so forth and so on until the end played itself out. Novelize set itself in front of me and gave me an easy, open page and layout with which I could dive into, without distraction. I would say, first and foremost, keep writing. Whether it’s good or bad, keep writing. It doesn’t matter if it stinks so bad your eyes burn, just KEEP WRITING. Write for yourself, write for joy and your own self accomplishment. Don’t worry about Publishing or Agents until the time comes to do so. You’ll know when that is. I’m in this battle right now and have taken some hits but I keep writing. I keep moving forward, fighting my own good fight. As far as your time writing, keep it pure and simple. Stay in the worlds you create until the time comes to let it go. It’s your child and like all children, the time will come when they grow up and move on. Let them. Weep for them if you must or be proud and scream for their success out in the world. Watch them live and breathe, then go create another one and love it as much as the last. I don’t have a professional website as of yet but i do have a blog that I haven’t written in for far too long. Novels have a way of stealing what little time you have away from everything else you write. But, if you’d like to get in touch, you can check that out.